Hand Strapping is a type of plastic strap that can be tensioned using manual hand tensioners or battery operated strapping tools. Hand strapping has a great variety of industrial and agricultural applications. 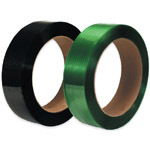 In general plastic strapping can be used to bundle, palletize or package product. Hand strapping is wrapped around the product and tensioned. The plastic strap can be tensioned using a manual strapping tensioner to cinch down the strapping and a strapping seal or buckle can be used to hold it secure. The core size of strapping used is dependent on the strapping cart. The break strength required is determined by the weight of the product or pallet. Battery operated strapping tools offer an extremely productive efficiency to packaging using hand strap. At Boatman marking we have a large offering of hand strapping and plastic strapping tools. Automatic Strapping is a category of plastic strapping that is specifically for the use in strapping machines. Plastic automatic strap is manufactured to be strong enough to not slip and cause jams in strapping machines. Automatic strapping is also more flexible so that it can interweave through all the wheels of a strapping machine and through the corners of an arch strapping machine. ¼ inch machine strapping is usually for the application of binding mail trays while thicker straps can be used for heavier products. It is important to match the core size with the requirements of the strapping machine that you operate. The strength of the plastic strapping required is a function of the weight and dimensions of the product you are binding. At Boatman Marking we have a wide array of plastic automatic strapping and strapping machines for many applications. Polyester strapping is a type of heavy duty plastic strap. Polyester strap like plastic strapping is used primarily to bundle and securely palletize product. Polyester strap rivals steel strap in its load handling abilities. It also has several other advantages. Plastic strap is lighter and easier to work with when compared to steel strapping. Polyester strapping is quite often cheaper than steel strapping but that depends on the price of oil. Plastic strapping now has a number of battery operated tools that greatly improve efficiency and productivity. 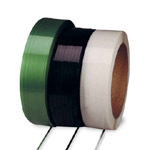 Polyester strapping is the growing face of plastic strapping in general. At Boatman marking we have a long list of polyester and plastic straps that can meet you needs. Please call us if you have questions. 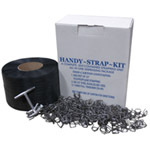 Strapping kits have a pre-cut length of strapping and buckles to use for occasional light duty jobs.